When looking ahead, a year always seems like a long time. But when we look back, it really seems only like yesterday, despite the fact that a lot may have happened in that period of time. When I consider where I was with astrophotography exactly 1 year ago, I found myself just starting to be comfortable with my equipment, the use of it, and the post processing of my images. I was at the point where I knew enough to be able to get decent results some of the time. If I managed to get acquire good data, the post processing went well. If my data was difficult, chances are I’d have one hell of a time processing it and would end up junking it. And by junking it, I don’t really mean deleting the files. I just meant filing it away on my network storage in my image archive. In the last year, I’ve become far more proficient with Photoshop and other post-processing techniques. I’ve revisited old data of deep space objects a few times and played with it seeing if I could improve on the original images. Overall, I’ve noticed huge improvements in my reprocessed data just because I now actually understand what I’m doing in Photoshop. I’m not just repeating something I saw in a tutorial video hoping it works out. In a couple of cases, I managed to pull up old data that I thought was trash and actually make it work. But there was one area where my experience is still slim, even to this day. That’s lunar and planetary photography. I’ve done alright with lunar imaging. Wide field lunar imaging using my DSLR camera is pretty good. I have a decent handle on that and the post-processing required. 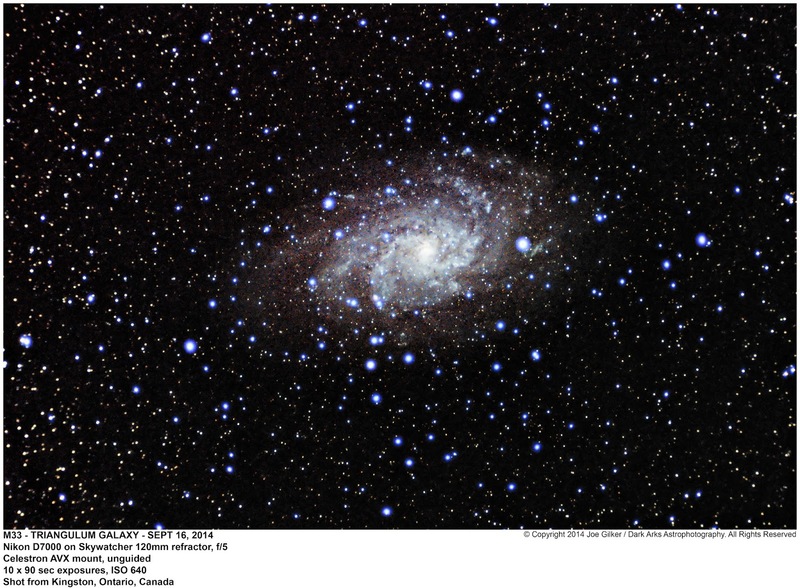 But imaging with my Celestron NexImage 5 had given me mixed results. I had gotten some pretty decent shots of the moon overall, and a few so-so images of Saturn and Mars. But I never seemed to really come close to what I’d seen other people doing. I was quite unsure if I was doing something wrong, or my camera was really just overpriced junk. To be fair, I purchased my NexImage 5 in May hoping to get shots of the planets through the summer via my 8″ Meade LX90. Schmidt Cassegrain scopes are great for planetary and lunar imaging due to their long focal lengths and the great resolution their larger primary mirrors can deliver. But as luck would have it, my LX90’s mount died 3 days after getting the camera. 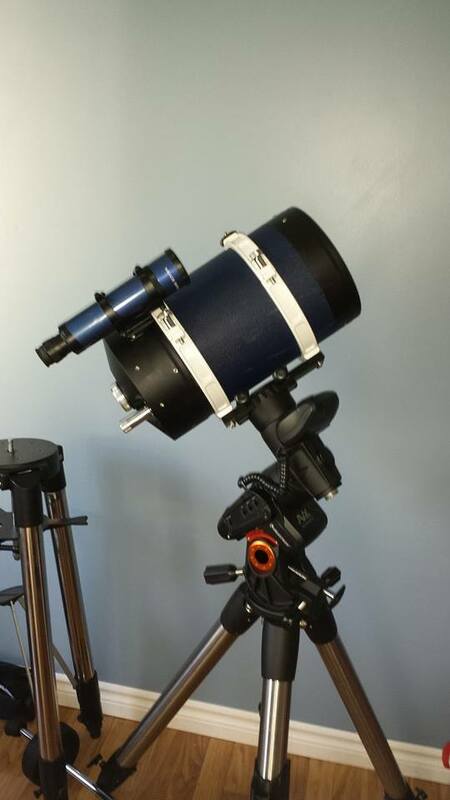 And for anyone who’s followed this blog or my astronomy adventures via the various astronomy-related Facebook groups I’m a member of, you’ll know the issues I had dealing with Meade to get my scope repaired. I chronicled the ordeal in another blog entry earlier this year. So while Jupiter, Saturn and Mars were at their prime, I didn’t have the scope the NexImage 5 was intended to be paired up with.. By the time I got the scope back at the end of the summer (still broken) and got it operational again, all 3 planets were basically setting just as night fell and I never got a change to image them with my LX90. The same day I bought the NexImage 5, I also bought my Sky-Watcher 120 mm f/5 refractor and AVX mount, so luckily, I had a scope to use through the summer. I did make several attempts to image the planets using that scope. I got a couple of acceptable shots of Mars and Saturn, but the results were rather underwhelming. The small scope is intended for wide field imaging, not for planetary use. Although I did get some decent shots of the moon with it, including a really nice high resolution mosaic of the moon assembled for 16 different images stitched together. Aside from that, most of my planetary images were just borderline acceptable, My 2 best were shots of Mars and Saturn taken on May 24 as seen here. All things considered, I’m certainly not disappointed with either of those shots, but compared to my deep sky and widefield imaging, they left a lot to be desired. And of course, I knew the scope was the issue. Mars is difficult even in larger scopes. I’m in no way disappointed. The image of Saturn is also quite good considering the equipment that it was shot with. Since I barely knew what I was doing in post processing with planetary images, I think the results were good all around. But I was DYING to try out my NexImage camera on my LX90. 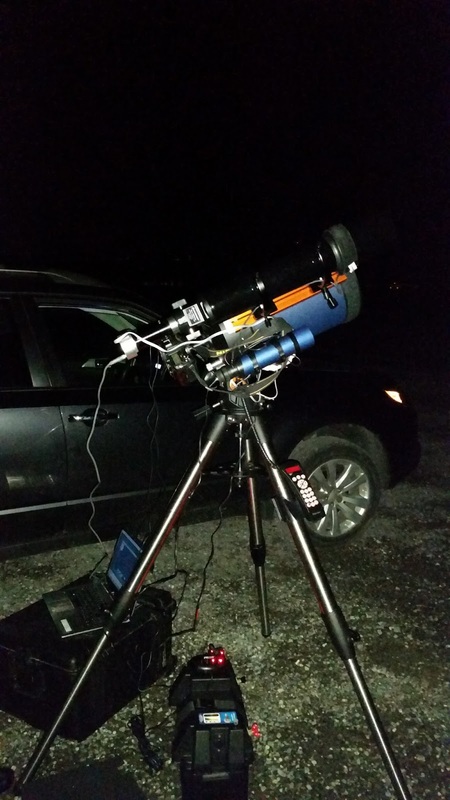 In August, my main astro-buddy Kevin finally got his own scope – a Celestron NexStar 8SE, an 8″ Schmidt Cassegrain. So having access to an 8″ SCT that was very much comparable to mine, we decided to test my planetary cam on it. As luck would have it, the atmosphere was terribly turbulent with less than ideal seeing conditions and the planets were low on the horizon, but I had to try anyway. And the resulting image I got of Saturn was a vast improvement over my refractor. It wasn’t great by any means, but finally I was getting good resolution and colour. The big scope’s extra magnification and aperture made a huge different. While this was a huge improvement over my past attempts, I still wasn’t truly satisfied with my results. But it was an improvement, and at least it showed that really I could do much better than what I’d been doing. 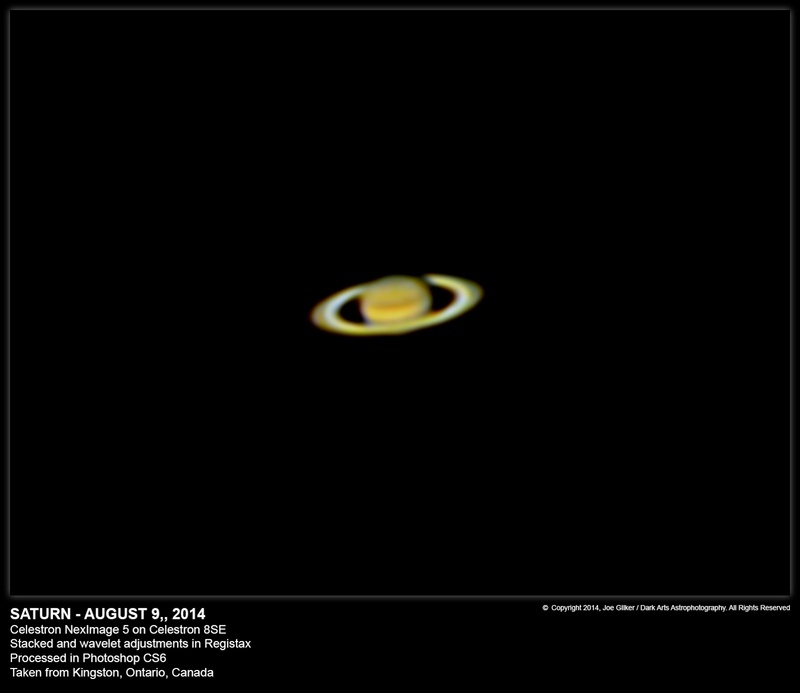 Unfortunately, I’ll have to wait till next spring when Saturn is once again visible to try to top this image. 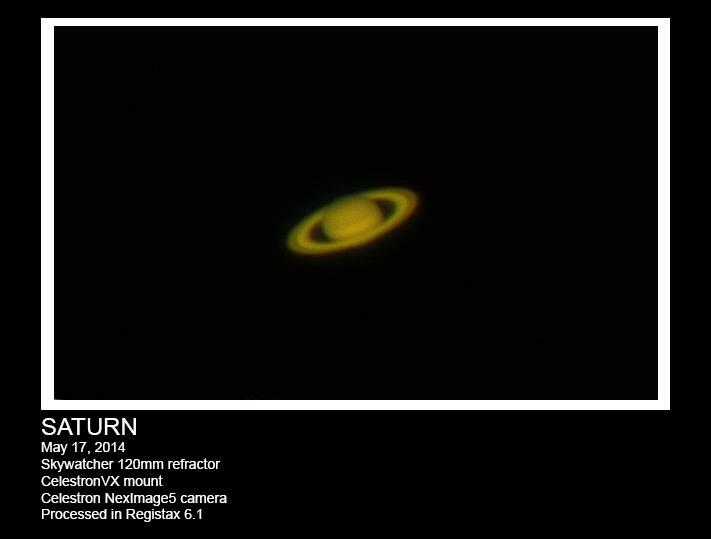 In the meantime, I have some other old data of Saturn that I want to see if I can improve on. But this has been a bit of a digression of the topic of this blog entry – trying again with failed data. But I felt I had to go on this tangent and put this info and these samples out there as a preamble (along with some eye candy) so it fit in the great context of the story in terms of what my previous planetary imaging experience had been. While my hands-on experience with planetary imaging has been fairly limited, I have learned enough about Photoshop and other tools of the trade that when I saw some of my older data that I had written off as “scrap”, I knew it could be salvaged. 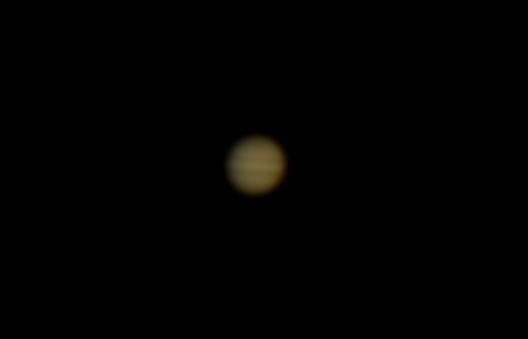 The best example I’ve come up with is my first attempt at shooting Jupiter back on Nov 4, 2013. I was out shooting other things that night, and Jupiter rose. I had my Nikon D7000 mounted on my LX90. So I took a series of images of it. Now, for those in the know, a DSLR on an 8″, f/10 SCT is not the ideal for planetary imaging, but I thought I would try it out. With my total lack of knowledge on how to process images at the time, this is the best I could come up with. So you can definitely tell what planet it is, but it’s dim, and there’s really no detail in it at all. 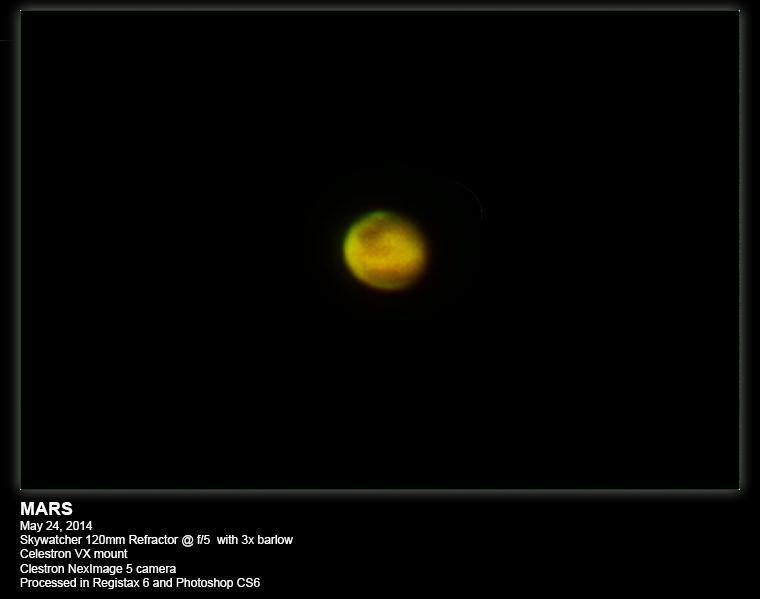 I uploaded it to Flickr anyway because it was my first image of Jupiter, and it would be the benchmark by which I would judge future attempts. And this is the data that I came across in my sorting yesterday. I saw the source images, and to my slightly more experienced eyes, it actually looked pretty good. It certainly wasn’t the train wreck I had originally considered it to be. So I took it upon myself to see what I could do with it. Imaging my surprise after stretching the histogram and 4 Galilean moons jumped out of the image! I couldn’t see them in the source frames, but there they were! I was amazed. And I started messing with different processing techniques to sharpen and enhance the image. After a couple of hours, I finally settled on this as a final version.And I have to say, I’m amazed with the result. 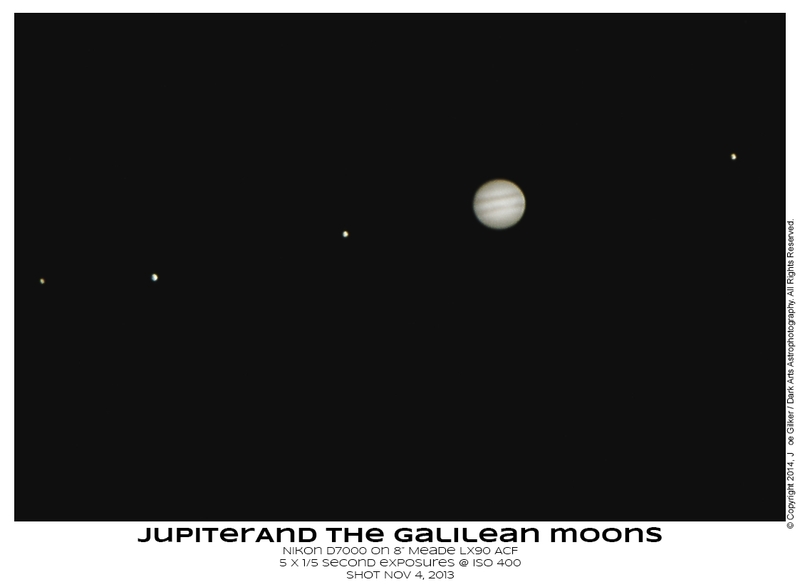 In terms of wide field images of Jupiter and its moons, this is actually pretty good. I had no idea that the old data I had collected was this good! Had I known this was possible last year, I would have put more effort into it. But the frustration of not being able to do anything with it due to my inexperience caused me to give up on it. Until now, that is. And I’m glad that I returned to it. So I guess this really goes to show what a year’s worth of experience using post processing tools can really achieve. I certainly don’t consider myself an expert in the field by any means. I’m still very much a novice. But results like this really serve to validate the knowledge and experience I’ve acquired in the last year. And it makes me hopeful for what I’ll be able to achieve in another year. And perhaps even sooner, as Jupiter is starting to rise on the eastern horizon at about midnight. It’ll be high enough to image earlier in the evening very soon, and I fully intend to take advantage of that and get as many images of it as I possibly can. And Saturn will be following suit shortly thereafter, giving me yet another window of several months to try to surpass my previous attempts. The lesson learned here is that just because I’m not able to do anything with difficult data I’ve collected today doesn’t necessarily mean it’s wasted. At some point down the road when I get better at the dark art of Photoshop, I may just be able to salvage it, as I’ve done today. So now I must return to the sorting of my old data to see what other potentially hidden gems I can fine. So until next time, clear skies and keep you eyes to the sky. The moment I had been waiting for now for months was finally on me. I got my autoguider, guide scope, dovetail, and finally my dew heaters as well. The 2 issues that plagued me the most – tracking and dew – would finally be vanquished! I headed out to my regular spot in an industrial park just outside of town and got myself set up. The first issue was cables. So many cables to deal with. Most were dangling around (I know, bad), but there was no wind, so at least that wasn’t affecting my imaging. On a side note, I’ve bought some velcro cable ties, so next time that won’t be an issue. But needless to say, for this evening, I had to deal with this tangle of wires the best I could. It wasn’t pretty, but it worked. I’ve got a better setup planned for next time that will result in the laptop sitting in the warm car with me. It took a lot longer than it typically takes me to set up this new rig. There was so much to connect. In my head, I knew what needed to be done and it isn’t terribly complicated. But actually doing it always presents some challenges in themselves. I did manage to get everything connected the first time without issues though. It just took me a lot longer to get it all sorted out than it typically does. Finally, I was polar aligned, the scope was aligned with 2 stars + 4 calibration stars. I got my focus on Vega using Backyard Nikon, and I was ready to fire up PHD and test out my new autoguider. And that’s when things got interesting / confusing. I had read the instruction manual that came with my Orion StarShoot AutoGuider. I’d played with it at home in day light to get familiar with it, but I wasn’t prepared for the screen full of noise that PHD presented me. I was baffled. I saw no starts. 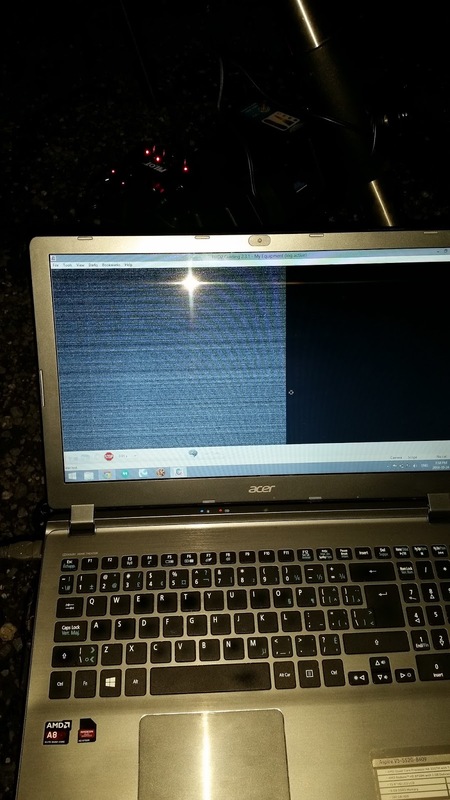 All I saw was a screen full of noise. I played with the camera gain, gamma adjustments, etc, and still couldn’t see anything. I opened up the manual and read it again, but I couldn’t figure it out. I was confused and didn’t know what to do. So I made a quick post to the Amateur Astrophotography Magazine Facebook group. I knew there would be someone that could help me out. And sure enough, responses started pouring in almost immediately. 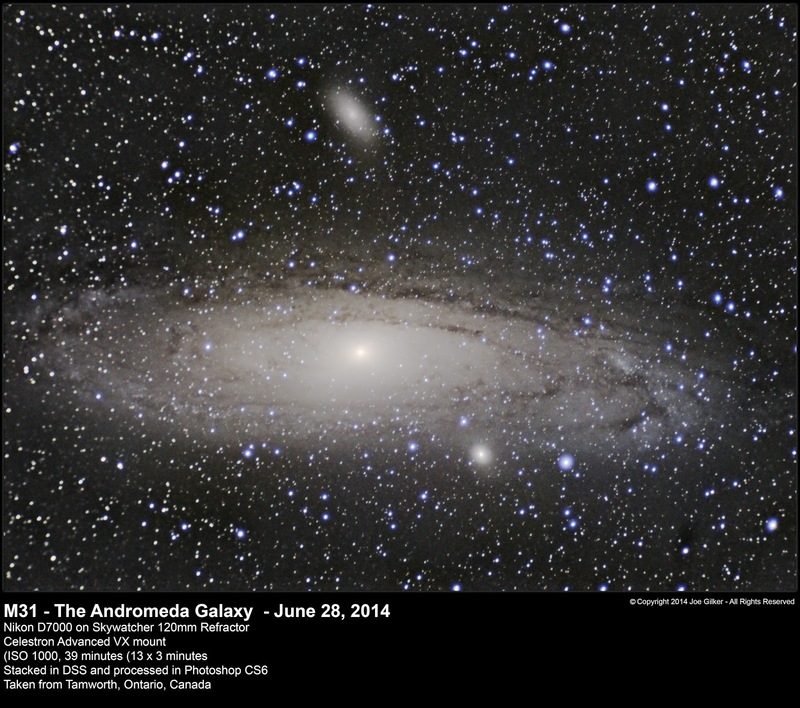 With some excellent advice from other more experienced imagers such as Mitchell Tubbs (East of Jupiter), Bubba Daniels, David Pointer, and Phil Quandt who use autoguiders, I finally managed to get my autoguider working. Thanks for the tips, gentlemen. You got me off on the right track! It turns out my primary issue was that my exposure times were too short. I guess while playing around with PHD at home, I had set the exposure time to 0.2 seconds and left it there. That really wasn’t long enough of an exposure to register images of the stars or even to get focus with in the first place. Once I managed to acquire an image with the autoguider using Vega as a target, I managed to get my guide scope in focus. Once I had that, things started going smoothly at last. Once PHD calibrated, I was good to go. My first order of business was to test out the tracking now that I had the autoguider. Previously, I’d been unable to track using this scope at f/10 for more than 90 seconds without getting some trailing. So it was time to put things to the test. 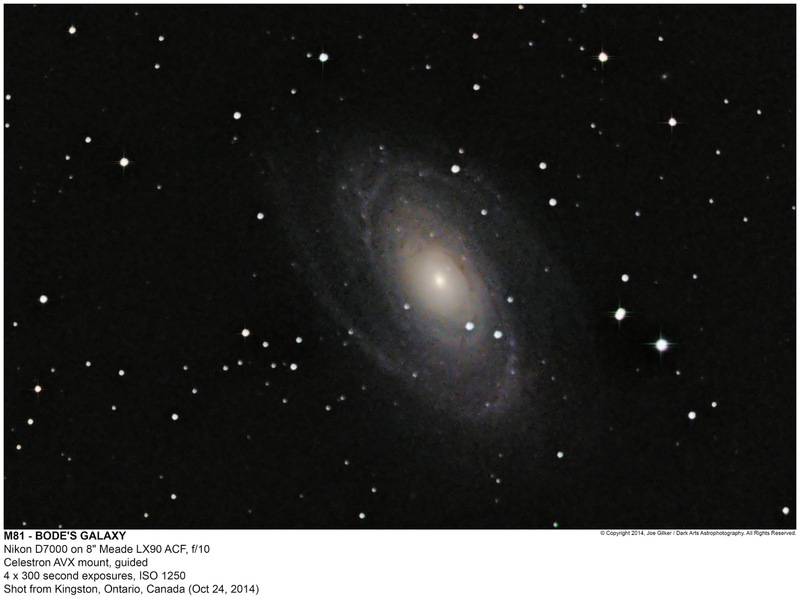 The first target of the night was M81 with 300 second exposures. I’d shot this target before using this scope. However, I had shot it at f/6.3 using my focal reducer and had shorter exposures.This time, I wanted a higher power view of the galaxy solo. I got over an hour of data on it, but for some reason, neither DeepSkyStacker nor MaximDL will read about half of the exposures. I’m not sure what the issue is there, as they should all be good. But in any case, for the test run, it worked out well. I got a fairly decent view of it. Nowhere near as good as I would have hoped, but since this was really just a test for my tracking, I’m pleased with the result. I’m certainly not disappointed in the result. It doesn’t have as much detail as I would like, but that’s the down side of imaging at a high focal ratio. You need a lot of good, clear exposures to create a final image that doesn’t have data gaps. M81 happens to be bright enough that I managed to get a good image despite only having 20 minutes of data. 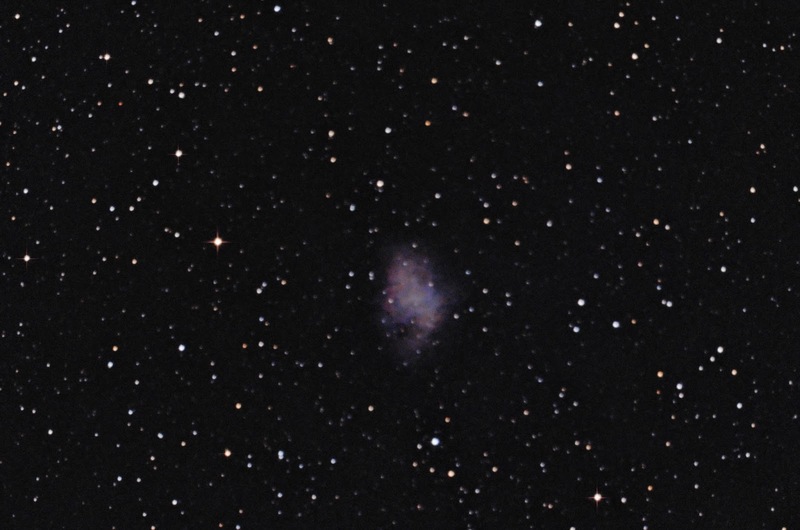 The second target for the night was one I had never shot or seen before – M1, the Crab Nebula. I’d been wanting to get a shot of this one for a while now, and I figured this was as good a time as any to do it. I was hoping for something better, but unfortunately, it seemed my focus was off. Normally I try to refocus between targets, but I didn’t this time. I got 8 shots of it, but 6 of them were quite blurry and didn’t make it into the final image. I didn’t think it was quite good enough to post up on my Flickr page, but it was good enough to at least share on my Facebook page as a “failed attempt”. I had originally intended on getting more of M1 than I did, but realized that Orion had risen. And my ADD kicked in, making me want to switch targets. All in all, considering my focus was off on M1 and I didn’t realize it, that wasn’t a bad idea. My dilemma was now whether to shoot M42, the Horsehead Nebula, or Flame Nebula. All 3 are amongst my favourites. Having already managed good shoots of M42 and Flame in the past, I decided I’d turn the light gathering capability of my scope on the Horsehead, since I had never gotten an image of it that was to my satisfaction. The detail that I managed to pull out of this left me pretty impressed. Like my image of M81, there’s a grainy finish. It’s not so much due to noise, but rather the lack of data. 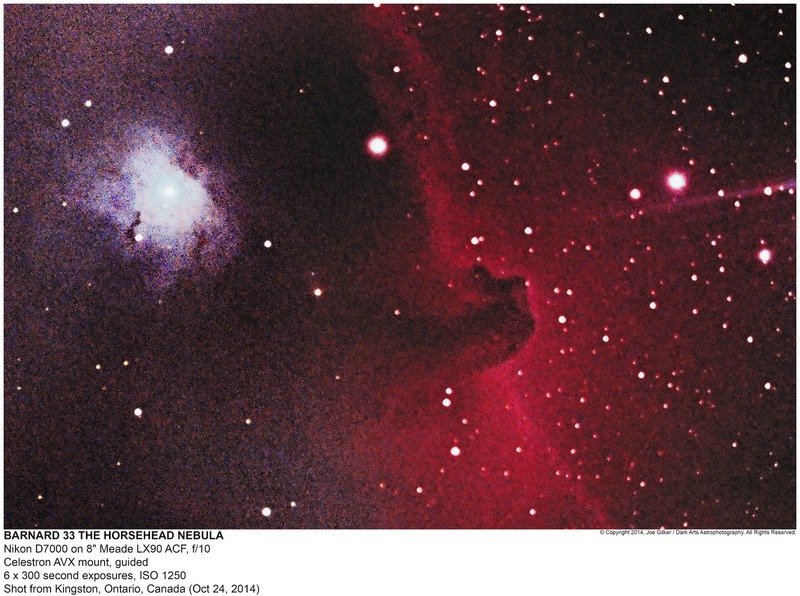 While the Horsehead is clearly visible with bright red shades, there are a lot of gaps in my data due to the short integration time. A mere 30 minutes of exposure time at f/10 is not enough to capture this dim object and all the subtle gas clouds surrounding it. But still, I was very impressed. In previous shots of this object, I had actually been shooting the Flame Nebula with my camera and a 300mm lens or with my widefield f/5 refractor. While I managed to capture the presence of the Horsehead, detail on it was never clear. This time, I clearly captured it, despite the “noisy” appearance. Far from perfect, but the level of detail here is impressive. While the imaging from this session is far from what I’d call spectacular, it was a successful evening out nonetheless. I learned to properly set up and use my new equipment, which is always my goal the first time I’m out with new gear. But the real successes of the evening were the lessons I walked away with. Autoguiders are great! They require some extra work to set up, but once set up properly, they’re essential for long exposure photography and will do a wonderful job of keeping your mount tracking. Take extra care to polar align the mount as accurately as possible, including doing a second polar alignment after my 2+4 mount alignment is complete. F/10 is a difficult ratio to image at, especially when you have a 2m focal length. I now know I need a lot more integration time to get clear images out of my setup at f/10, Chances are I’ll likely stick with f/6.3 using my reducer for most of my imaging. It will be a lot more forgiving and will allow me to get more complete images in less time. Take the time to re-focus between targets to ensure good images. Had I done it in this session, I would have had a semi-decent image of M1. So all in all, I’m pleased with the outcome of this session. I quite look forward to heading out again at the first chance I get to put this setup to the test again. So until next time, clear skies and keep your eyes to the sky. A while back, I wrote a blog entry about the issues I had with my Meade LX90 mount. Despite being sent back to Meade for repair (at great expense), the mount still didn’t work right. I made the decision to remove the optical tube from the LX90 fork mount and mount it on my Celestron AVX equatorial mount so I could track properly for long exposure photography. I made this decision based on a bunch of stuff I read in various forums about people who had “deforked” their LX90 and LX200 tubes and mounted them on equatorial mounts. Based on what I read, I concluded I had 2 options to do this. The first was using a dovetail plate, and the second was using tube rings. Normally, Schmidt Cassegrains use dovetails, but I managed to get my hands on some inexpensive tube rings made for an 8″ reflector, so I went that route. I figured it would be easy to attach a short dovetail to the top of the scope for a guide scope or other accessories, so it would be very convenient. And this assumption was correct. And it worked great. The first couple of times I went out observing I concluded that I had make a great choice. However, I soon realized the error of my ways. For visual observation, this wasn’t an issue. The tube was perfectly balanced. However, when it came to astrophotography with my DSLR, the weight of the camera on the back of the scope threw off the balance of the tube completely. And there was no way to move the tube forward in the rings to balance it. I still managed to take pics with it this way, and have been for a while, but I now know it’s less than ideal. When I made my decision, I hadn’t taken the balance issue into account. The accounts I read on other forums of people using tube rings were for visual observation, which was perfect. But for photography where a lot of stuff is usually attached to the telescope, this just wouldn’t do. Now that I’ve started using my LX90 for photography, I’ve come to see how its long focal length affects tracking. 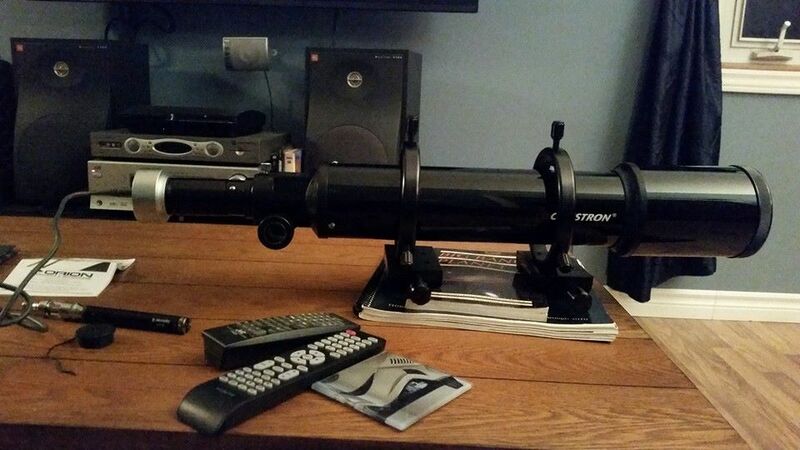 With my 120 mm f/5 refractor, I can easily get 3+ minute exposures while maintaining pinpoint accuracy on my stars. But the LX90 is a completely different beast. I’d never done more than 30 second exposures using that scope. I realized that even with accurate polar alignment, 45-60 seconds was pretty much the maximum I could manage before seeing star trails. Using my 0.63x focal reducer helped and I could track up to 90 seconds. But anything beyond that was useless. And with such a high focal ratio, I need to be able to get at least 3 minute exposures to get decent images. And I’m sure that the balance issues I’m having with my tube play a role in the tracking errors as well. In order to increase my tracking accuracy, I purchased a guide scope and autoguider camera. The guide scope is a nice 80 mm Guidescope Package from Celestron. This includes an 80 mm, f/7 refractor and a set of 125 mm tube rings. This package attaches to the main tube or rings via a CGE type dovetail plate. Attached to this is an Orion StarShoot AutoGuider camera. I could mount this on my tube rings, but realized it would throw the balance off even more, so the situation is less than ideal. In the end, I really didn’t have a choice. I had to get the proper dovetail plates, both to attach my scope to my mount, and to attach my guide scope to my optical tube. Otherwise, using the rings would introduce even more balancing issues. So I had to lose the tubes and do this right. So I placed orders for a Meade-compatible dovetail mount from Losmandy and the Celestron CGE dovetail plates. Yesterday, I received my Losmandy plate. Installation was dead simple. I had to remove 2 of the screws from the telescope tube, align the dovetail, and insert 2 longer screws provided with the dovetail. Now balance is restored. I can move the OTA forward as far as necessary to balance it with the camera attached. Another advantage is those 8″ die cast tube rings are heavy. They added about 6 lbs to my set up. Removing them and replacing them with this lightweight aluminium dovetail makes my overall load much lighter. 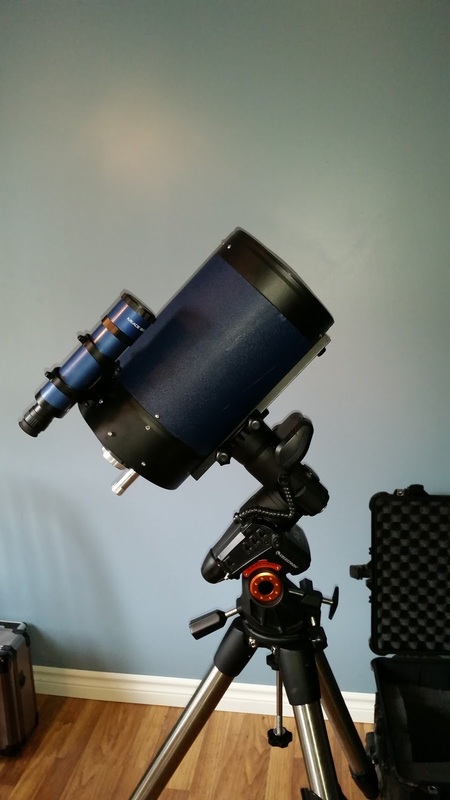 The Celestron AVX mount is solid, but only designed for a maximum payload of 30 lbs. Ideally, one wants to keep the weight at about 50% of the mount capacity for optimum performance and minimal stress on the motors and gears. The OTA by itself weighs 14 lbs. The camera adds another 1.5 lbs or so, and the guide scope and rings are 7 lbs combined. So altogether, I’m riding about 22 lbs of gear on my mount, which is clocking in at 73% of the mount’s maximum load capacity. The extra 6lbs from the large tube rings would have put me at a very uncomfortable 28 lbs. Add to that the imbalance and I don’t think even the autoguider setup would have been able to save me and keep the scope tracking properly, let alone the undue stress I would have been putting on the gears and motor on the declination axis. This was really the only option that I had to properly mount my system. So the moral of this story is simple – before doing something like this, thoroughly do your research and consider options carefully. I now have a set of 8″ tube rings that are useless to me (for now) as a result of this blunder. They were reasonably cheap, but I still could have saved this money had I properly considered what I was doing rather than just blindly choosing to do this. So until next time, keep your eyes to the sky. Clear skies! Astrophotography is an art form just as regular “terrestrial” photography is. As astrophotographers, we strive to capture the invisible beauty of the skies and make it visible for all to see and admire. And as with any discipline, we strive for what we as individuals see as perfection. From the time we arrive at our chosen site to the moment we publish our final image, there’s a myriad of steps we need to follow. A failure in any of the steps in this process can lead to undesirable final results. I’ve been there many times, as I’m sure many others have been. I’ve had far more failures than successes, although I am seeing the failure rate decline as I gain experience. There are many factors we can control – gear setup, mount alignment, camera settings, decisions we make in our post processing, etc. And there are as many factors that we’re slaves to, namely weather, seeing conditions, light pollution, etc. Astrophotography is a multidisciplinary pursuit. 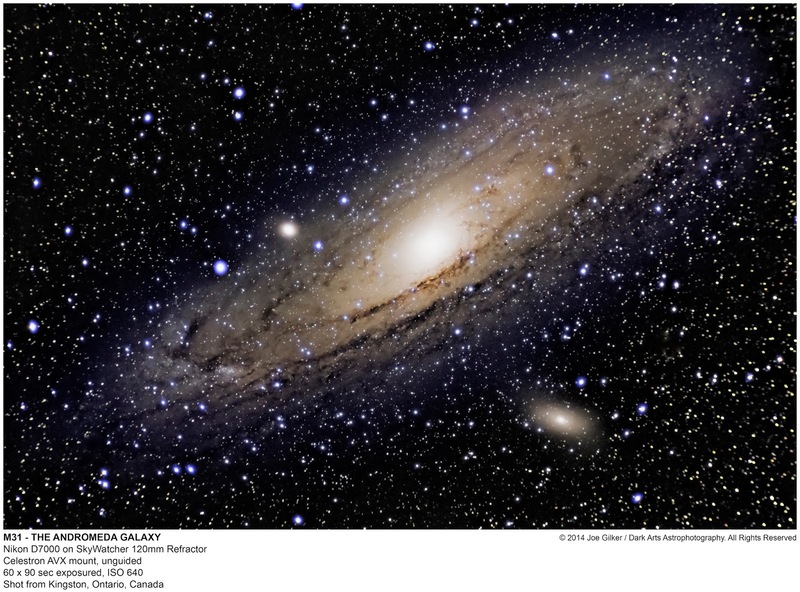 It requires a solid foundation in astronomy to know the objects, where to find them, and have a reasonable understanding of celestial mechanics. Without at least a working knowledge of the sky, it makes the rest of this process impossible. We have to have a good understanding of our equipment, how to set it up and how to use it. 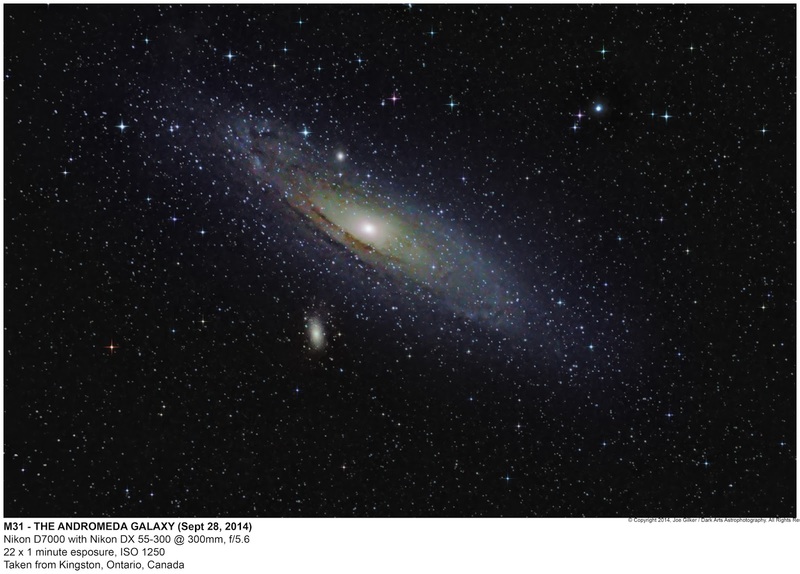 As “easy” as it is to set up a computerized go-to scope for visual observation, we have to have the process down to a science for photography. Slight misalignments which are acceptable for visual observation will utterly ruin a photographic session. And this is just a basic set up. When you add CCD astronomy camera, auto-guiders, computer control, etc, it gets even more complicated. It’s surprising you don’t need a degree in Computer Sciences to to this. We have to have a good basic understanding of meteorology to understand how atmospheric conditions affect our imaging. Knowing how the atmosphere affects our views of the sky is an important aspect. Often, skies that look clear will be terrible for imaging due to turbulence in the upper atmosphere. We have to be aware of these conditions that aren’t always readily apparent. We have to understand photography and how to effectively use our gear. There’s no auto mode for astrophotography. You have to set your camera to manual mode and know the relationships between your aperture, shutter, ISO, etc. And of course, we have to learn to use our equipment effectively. And last but not least, we need to understand the software we use to process our images. 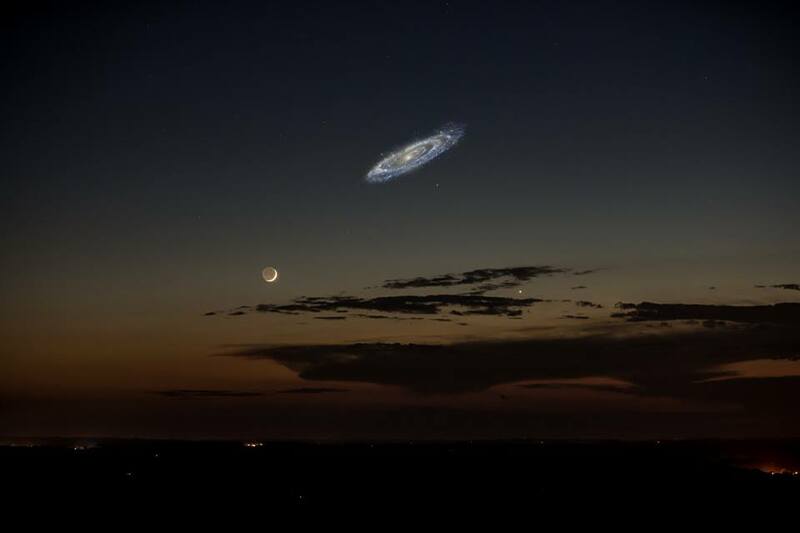 Photoshop in itself is a hurdle that can have even the most adept amateur astronomers curled up in the fetal position in a corner sobbing like a little girl. I’ve had a professional photographer with years of Photoshop experience try to process one of my astro images and it frustrated him to the point he was ready to throw his computer out the window. It’s not easy! But in the end, we all strive to get that “perfect shot”. But what is perfection? And is there really such a thing? And if there is, can it ever truly be attained? And if it could be attained, what then? What would one have left to strive for once this hypothetical “perfection” has been reached? This is a little more philosophical than I normally tend to get in this blog, but it raises interesting points. In my view, there is no such thing as perfection. And it’s a good thing that there isn’t. What drives the creative spirit is the pursuit of improvement. The drive to exceed what we’ve already done and set a new benchmark for ourselves is the real goal. If we ever were to attain perfection, there really would be nothing left to work towards and it would make our chosen pursuit pointless. We;d hit the end of the road. Any art form (and life itself) is a learning process. As we progress, we develop new skills. As we add these tools to our repertoire, we start seeing things that we didn’t before. We expand our possibilities. Often, we look back on past experiences with the famous “…if had known then what I know now…” afterthought. We know we could have done better. 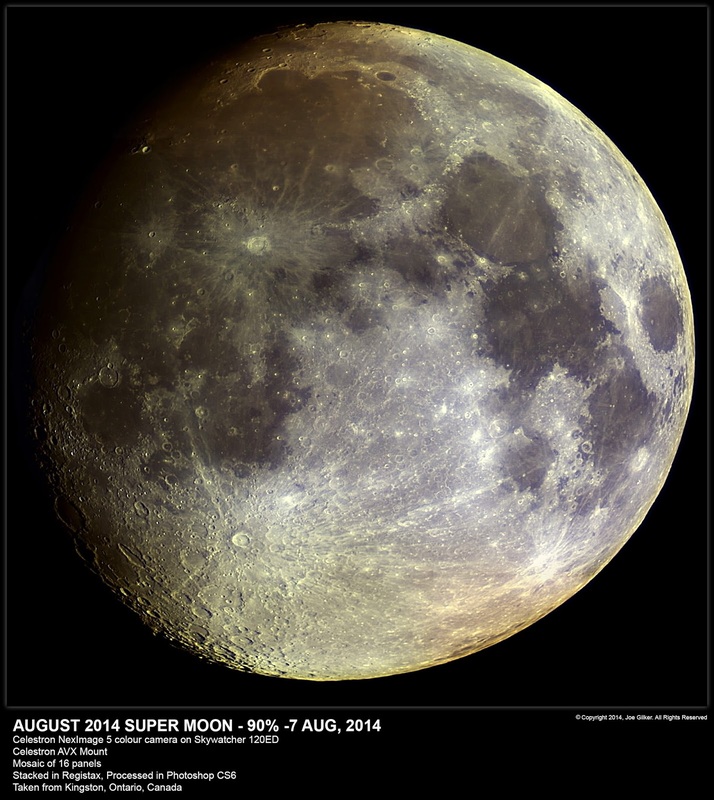 In many respects, we do have that opportunity as astrophotographers. We tend to hang on to our own data. Many of us go back and reprocess old data to try to improve on it. And really, I would encourage anyone to do that. It’s great practice. And it’s a great way to gauge ones’ progress in Photoshop voodoo skills. With that in mind, I set out to see what I could do with some old data. Over the past few weeks, I’ve been playing with various old images I’d taken over the last year seeing if I could improve on any of them. Some of them were improvements, but not terribly significant to the point I thought it was worth republishing. Others, I couldn’t really improve substantially and realized I had hit the limit of what I could do with the data I’d collected. That said, there was one image that had always been my favourite – an image of M42 I shot last November with only my camera and a 300mm lens. 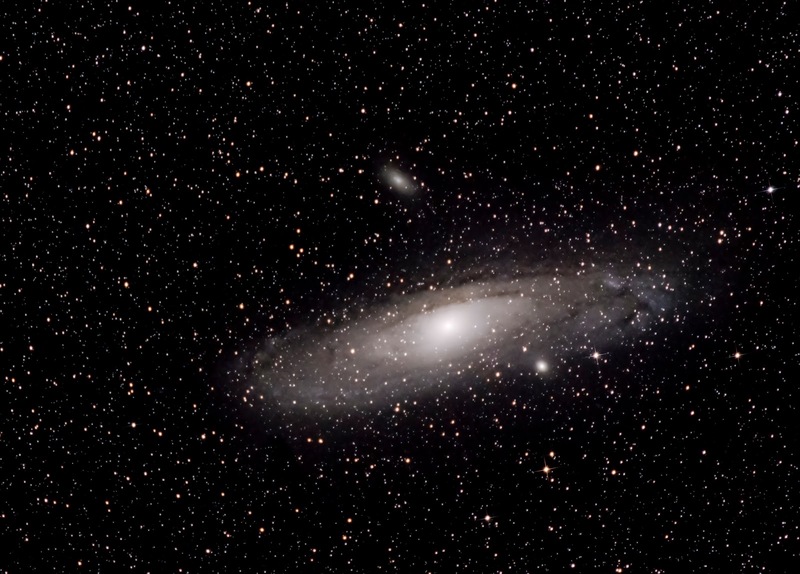 Until my recent stunning shot of M31, I had considered this by far to be my best image. I’d played with this image many times over the past 10 months because I knew for a fact there was a lot of data in there that I hadn’t been able to pull out at the time. It wasn’t until I developed my new workflow a couple of weeks back that I saw any real improvement in it from the original. I touched on it in my blog entry from September 2 called The Report Card. In it, I posted the image below comparing the original image I published on Flickr last year with a newly reprocessed version using my new workflow. Image posted Sept 2 showing improvement to my old image due to my new workflow. Needless to say, I was very pleased with the result, but not content with it. I know what M42 is supposed to look like. 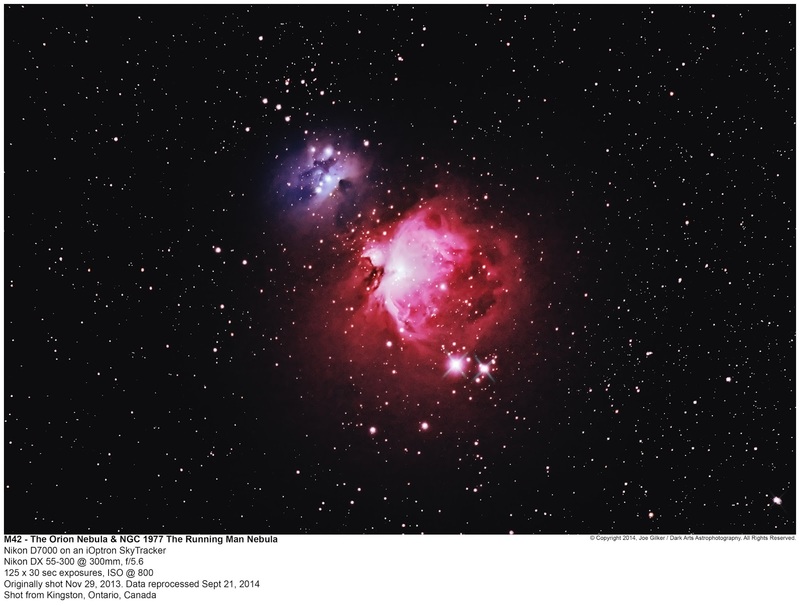 I know there’s a lot of nebulosity around M42 and between it and NGC 1977. A lot of that data was in my picture. I could see a faint trace of it, but I hadn’t been able to pull it off without blowing out everything else in my image. But I was determined to bring out the Hα detail. So I set about working over the image again. Hα is not easy to capture with a DSLR, particularly with an unmodified Nikon. But I was determined to squeeze out as much of this impossible detail as I could. Using some layer masking and blending modes (which I how understand thanks to Doug Hubbell’s awesome YouTube channel), I was able to separate this barely visible detail from the main image, convert it to monochrome, and run the “B&W -> Hα False Color Black Space” action from Noel Carboni’s Astronomy Tools action set. That converted my faint, barely visible detail around the fringe of M42 into deep, rich red hues that I was able to blend back into my original image to produce a much truer representation of what M42 should look like. It’s not just just a pinkish / reddish blob in space. It’s a large tapestry of rich hues and colours that fades out from a bright core. And I’m now displaying it as it should look. So is it good? Absolutely. I’m ecstatic about this image. This is what my old image should have looked like had I been adept enough at Photoshop back when I originally processed it. Is it perfect? Not even close. There’s still some faint nebulosity that I could have pulled out, but I think at this stage, it was more about finding the balance between pulling out the maximum amount of faint detail I could and keeping the image as noise-free as possible. Stretching any more would have brought out noise and pixellation that I don’t want. I did manage to bring out a bit more detail than what is seen in this final image, but the resolution of it was poor with terrible contrast. It just didn’t do the image justice. So I made the “artistic” call to dial it back a bit to what you see now – a nice, clean image. I do believe I’m near the threshold what I can do with the data contained in this image. After all, this is just from a camera with a 300 mm lens on a tracker shooting 30 second exposures. There was no telescope involved here at all. I’m really not able to get the resolution I need to bring out the contrast and fine details in the nebulosity with such a small aperture. That kind of resolution is the realm of a telescope with much better light gathering capability. And you can bet I’ll be training my 8″ SCT with a 0.63x reducer on it as soon as M42 becomes visible in the evening sky. And I look forward to capturing it from the pristine dark sky at the L&A Dark Sky Viewing Area. So how does this all tie in to the more philosophical opening of this blog entry? Thanks for your time. I hope you found this article informative and entertaining. Please feel free to share it if you enjoyed it. I’d love to expand readership.